In 2014 I visited India on behalf of For One Another and with Hope Abides, a wonderful organization supporting education for orphans in India. 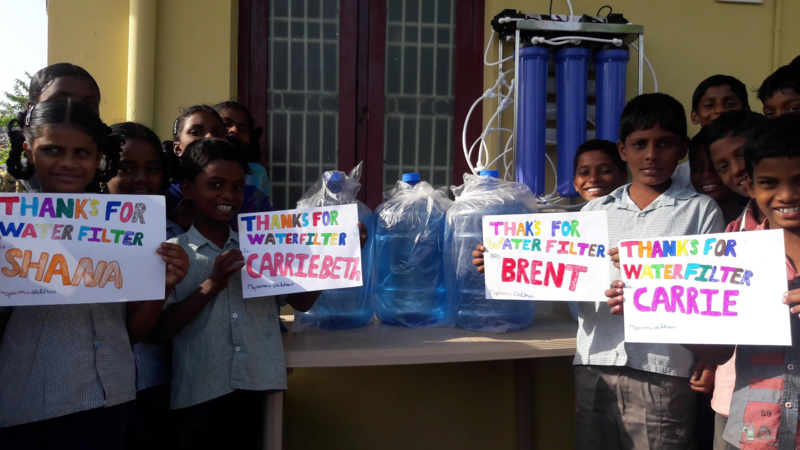 Through Hope Abide’s existing connections with orphanages throughout India we were able to distribute Sawer Point1 water filters provided by For One Another to local communities in need. Carrie Beth had asked me to keep an eye open for other potential projects that would be worthy of support by For One Another. To be honest, the trip was overwhelming. The needs are so great every where you go. Despite taking some water filters with us, it was difficult not to feel completely useless. 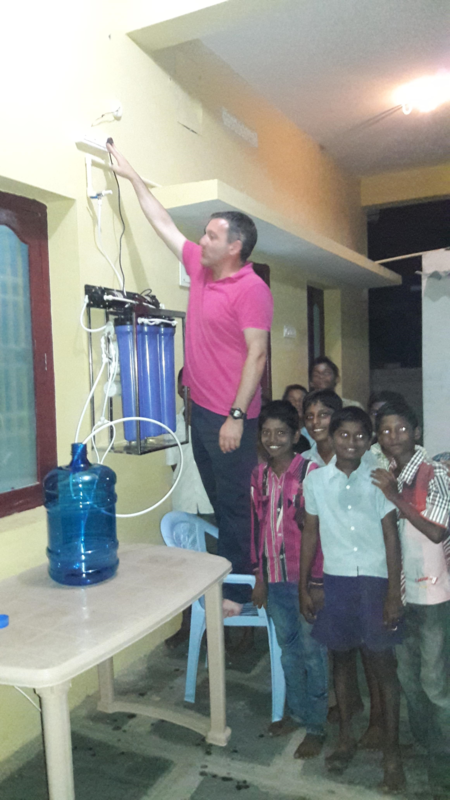 One case in particular was at a orphanage in Moparru in the Andrha Pradesh region of India. The orphanage had succeeded in raising funds for a bore well, but quickly learned that the water was salty and undrinkable. They were spending precious funds on purchasing water – a very expensive commodity in India. It’s true, the poorest of the poor pay the most for drinkable water. Raju Pallikonda runs the orphanage there in Moparru with his wife and own young children. He’s a kind man with a great sense of humor and a warm, kind smile. He and his family live a selfless life, living there at the orphanage amongst the children – a big extended family. During my visit I played “duck, duck, goose” with the children. Which they loved, and thoroughly wore me out because I was frequently picked as the “goose”! The children are all so grateful for any extra attention they receive. During one of my runs around the duck circle I fell and ended up on my back and was instantly encircled by concerned little faces… “sister, sister, are you okay?” while being hoisted up by little hands. The generosity of Raju is not uncommon there. In fact, his brother Pastor Ratnam runs an orphanage in the nearby village of Vellatur. Ratnam, with his wife Suneetha and two children also live generously there amongst the children. In addition to being home for more than 100 orphans they also run a school, do outreach to local villages and provide a home for abandoned elderly. During my visit I discovered many projects worthy of support. I hope that in the future we can continue to support some of them there. 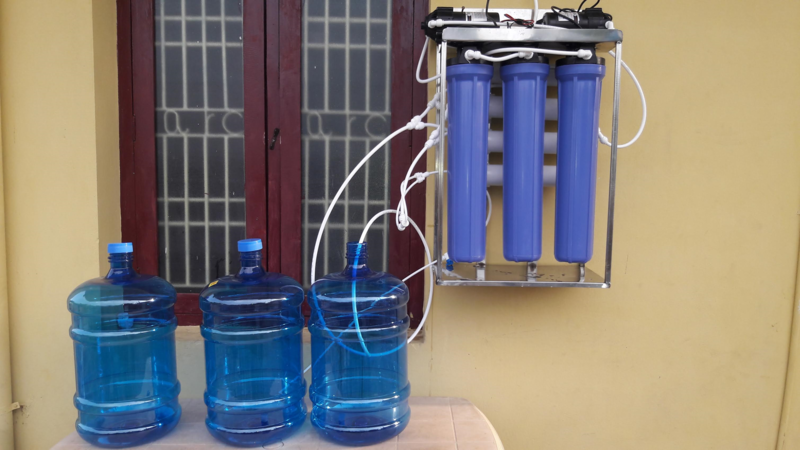 I recommended the reverse osmosis filter system at Moparru as a project for For One Another because I felt that it was a place where a small investment could make a huge impact. I felt that it would help support loving locals that are helping their own community to do even more there. Providing safe drinking water for these children not only ensures that the children remain well to go to school, but funding this water filtration system means that Raju and his family can use the money previously spent on purchasing water to help even more children and provide the best life possible for the children in their care.